Back to food Clive -Prawns a la plancha, an just amazing choice for me and one of my favourites and indeed a choice of many a close friend and family member. These weren’t done i n garlic just grilled and were just amazing and as you can see from the before and after pictures and as confirmed in the blog, heads were dissected and parts eaten as well. Just a big squeeze of lemon on them and a good dose of sun and happy days, what could be finer. I do think Rick also said the same as well, we are indeed following in his footsteps. 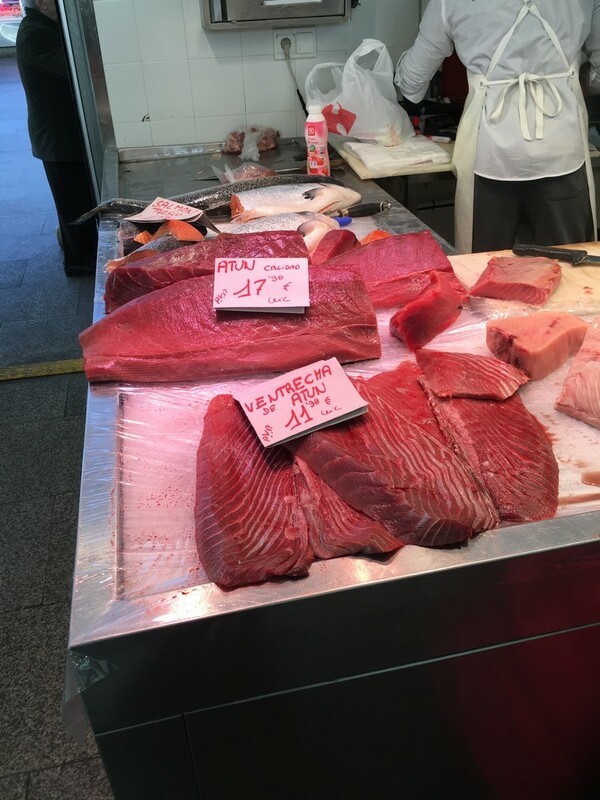 Fri 15/1/16: You can take the girl out of the town but you can’t take the town out of the girl and onto the town of Cadiz, a beautiful town indeed and as we stumbled upon a wonderful Friday market just as you would expect from a coastal town with an amazing array of fish and seafood on offer. We did not purchase as at this stage the thought of cooking fish inside didn’t appeal and we cannot BBQ on the site. Plus to be honest the novelty of eating out is still with us, so until my curry levels really drop than home cooking is a little bit further off. No menu of the dia again for us, although as ever always an option but just tapas as recommended in a guide book. Fish of all types –grilled, fried, steamed whichever what way you might like. 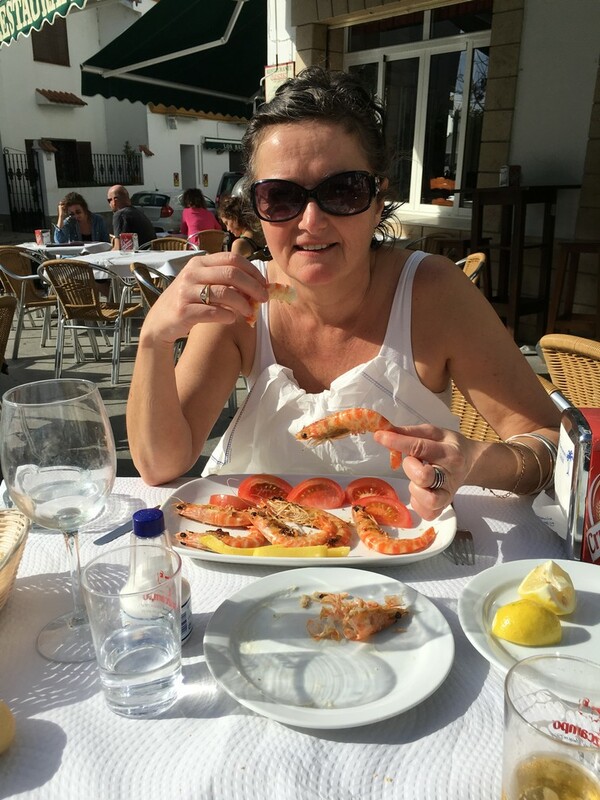 Oddly though m y choice of the day was anchovies in white wine vinegar-they surpassed all the other tapas choices by far. 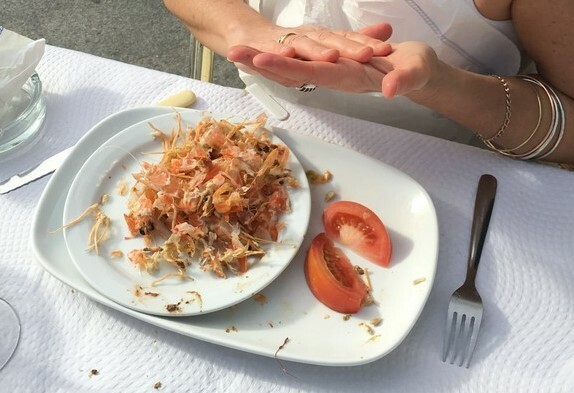 The little fish were well displayed and just so sweet and succulent and contrasted well with the sharp and delicateness of the white wine vinegar, yum yum indeed. 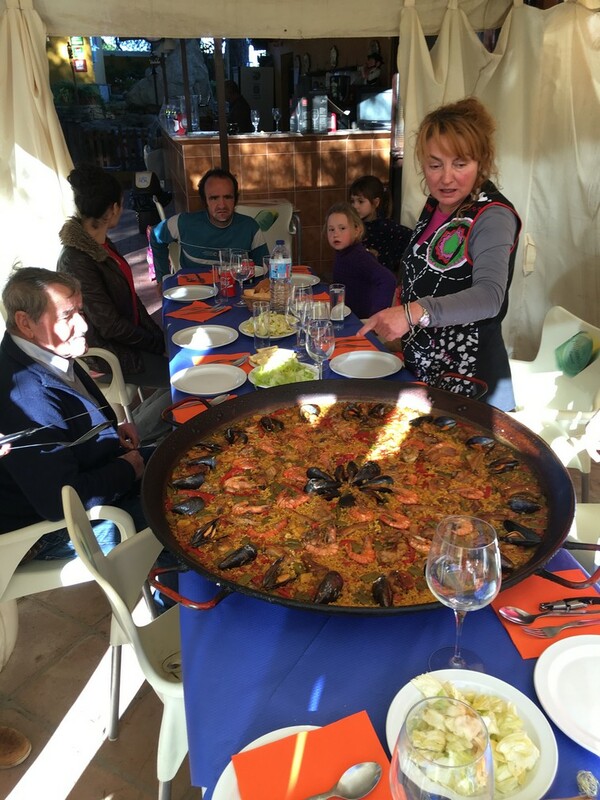 Sat 16/1/16/: no choice or dilemma here…… we had been invited to a birthday party by the family owning our current campsite and they were making paella in the true Valencia style which is the best and true paella apparently. We joined them to watch the preparation of the dish and this along with the happy family setting made for a true taste experience and honour for us- thank you Eva and Miguel. Outstanding hospitality especially as it went one step further and we had homemade pizza later in the evening! Pleased to see that despite all that sun you’ve not lost your strict budgeting skills. The food looks amazing. Always Menu Del Dia 8€! The food looks amazing is it slowing down your bike? Looks like you are still having fun. The bike slows down from time to time we are having some intermittent issues with the cutting out. (Both of them for the record). Mine in fairness has the most work to do. Is it possible to name the places where you eat? Sunday 17th sounds a good find but I have no clue where it is. I will ask Karen sounds like a plan of we really like it. Will let you know tomorrow at breakfast break! Ohohoh, that all sounds very yummyyyyy!!! Enjoy!